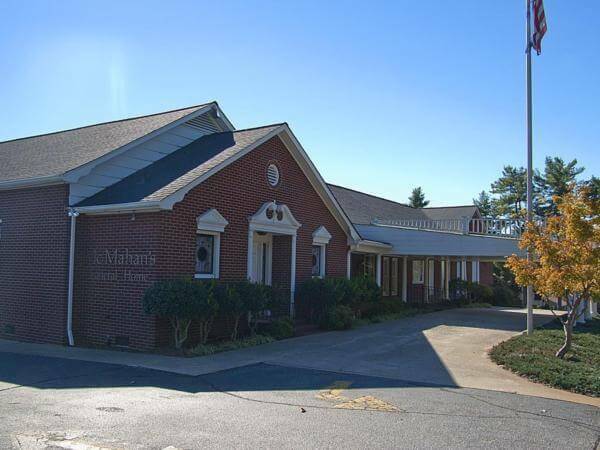 McMahan's Funeral Home was established on May 15, 1953 by brothers Frank and Clayton McMahan. Frank and Clayton both served in the Army during World War II and both graduated in 1946 from Gupton-Jones College of Mortuary Science in Nashville Tennessee. The business was started in Frank and Clayton's white framed childhood home on Main Street in Rutherfordton. As the business grew through the years, land adjoining the property was purchased and the funeral home was remodeled and a Chapel was built in 1960. Upon the death of Clayton in 1978, Frank's wife Charlotte Spratt McMahan began to work some in the funeral home for many years. Clayton's wife Margaret Wray McMahan retired from the Rutherford County School System as a elementary school teacher. Frank and Charlotte's son, John F. McMahan II graduated from funeral and embalming college in 1983 and began working in the family business. The growth of the business prompted a need to expand the funeral home, and in late 1983 construction began to add an additional 4,000 square feet. The whole funeral home was completely renovated and construction was completed in June of 1984. Today the business continues to be family owned and day-to-day operations are managed by John.